Despite studies linking moderate alcohol consumption to heart health, picking up a glass of wine isn’t the answer to prolonged life. The health risks associated with alcohol consumption, like liver disease, heavily outweigh the slight benefits – especially since those same heart healthy benefits can be achieved through diet and exercise. Yet people all over the world are still consuming high levels of alcohol. How does a country’s drinking habits affect its population’s life expectancy? By scraping the World Health Organization’s (WHO) Substance Abuse Country Profiles, we found each nation’s annual consumption of beer, wine, and spirits per capita. We then compared the average life expectancy of the top 12 countries by GDP (gross domestic product) with these consumption rates. Keep reading to see which countries may be drinking to an early death. Belarus, a small landlocked country in Europe, consumed the greatest average number of liters of pure alcohol per capita. On average, its citizens consumed 14.4 liters each year, over 1.5 times more than Americans. While the Belarusian government was quick to deny the statistics published by WHO, national anti-alcohol programs were implemented in order to decrease the level of consumption. Russia, known for its heavy consumption of vodka, drank an average of 11.5 liters of pure alcohol each year, less than the average of five other countries. While it still makes the top 10, the stereotype of Russians and vodka may be dwindling as Putin has been cracking down on illegal alcohol consumption in light of numerous deaths. 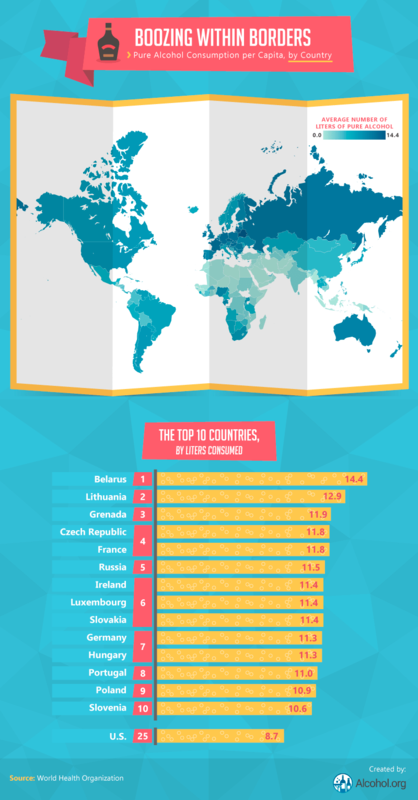 Ireland, Luxembourg, and Slovakia consumed slightly less, all drinking an average of 11.4 liters per capita. The U.S. claimed the 25th spot, drinking an average of 8.7 liters of pure alcohol per capita annually. When we converted the average number of liters consumed per capita into handles of vodka (roughly 1.75 liters), we saw fairly similar results. Citizens in Belarus drank an average of 48 handles of vodka per person. However, while this may sound like a lot, it only comes out to a little less than one shot a day (based on the average shot poured in the U.S., which is 1.5 fluid ounces). 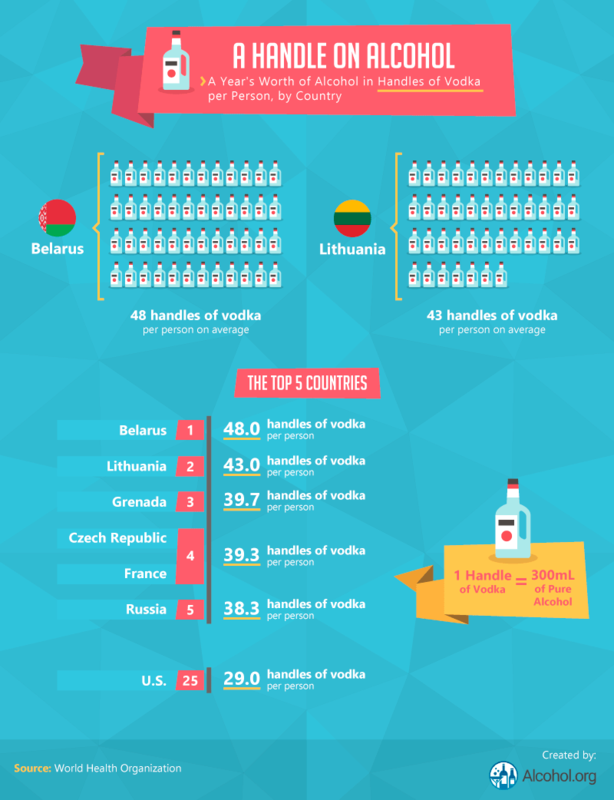 Residents in Lithuania consumed 43 handles of vodka per person on average, followed by Grenada with nearly 40 handles. The Czech Republic and France consumed an average of 39.3 handles of vodka each per person, and while Russia was among the top five countries for alcohol consumption, it consumed a little over 38 handles of vodka on average. The U.S., however, ranked No. 25, with an average of 29 handles of vodka consumed per person. Of the top 12 countries by GDP (gross domestic product), Japan had the highest average life expectancy at birth: 83.7 years. The long-living country had one of the lowest levels of wine consumption and levels of beer consumption that remained well below average, and overall consumed about one liter less of pure alcohol than the average. The country with the lowest average life expectancy, India at 68.4 years, also had low levels of consumption of alcohol. 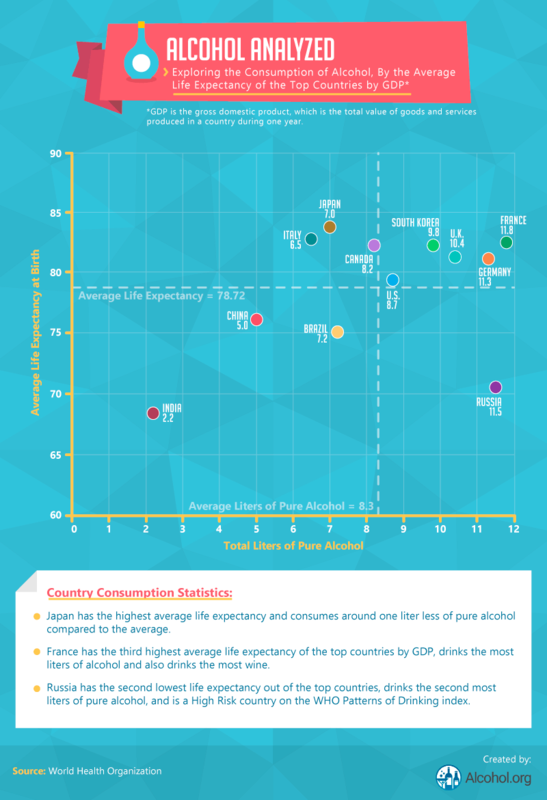 France consumed the most alcohol than any other top country by GDP and also has an above-average life expectancy. When we explored the data, France also drank significantly more wine than any other country, supporting its spot as one of the biggest wine regions in the world. Interestingly, not all countries who drank below the average liters of alcohol experienced higher life expectancies, which may point to other contributing factors for lower life expectancies. 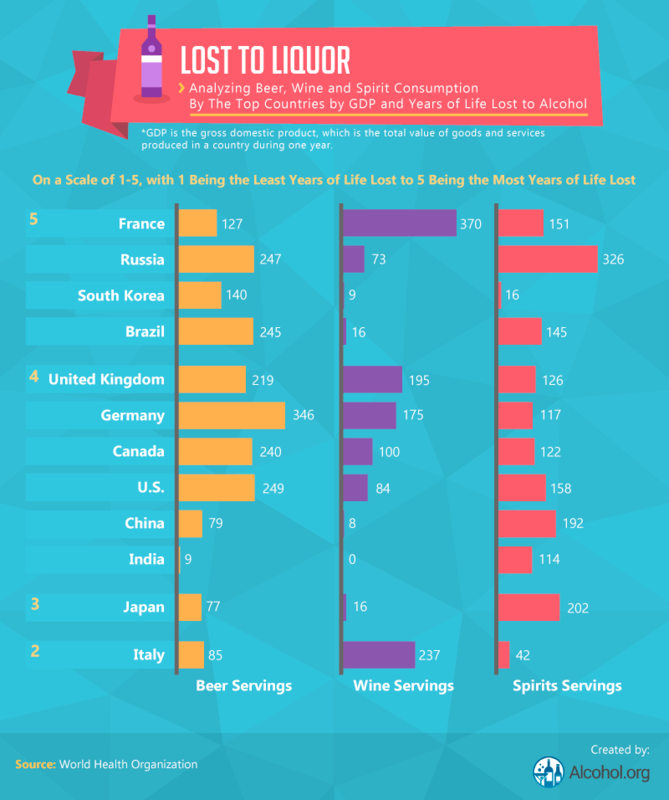 Based on beer, wine, and spirit consumption, we ranked the countries by the most and least years of life lost. 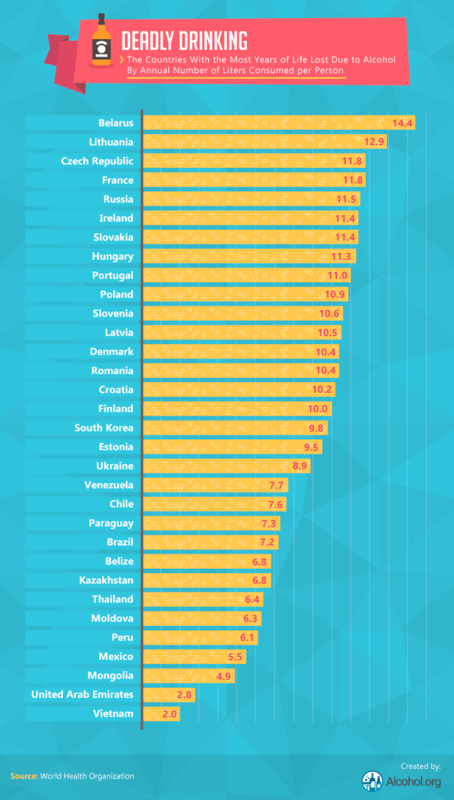 France, Russia, South Korea, and Brazil have the most years of life lost to alcohol, despite the fact that France had one of the highest average life expectancies. France had the highest number of wine servings per capita – a whopping 370 – but the French also had a relatively low average number of servings of beer. Brazilians, on the other hand, had a significantly low average number of wine servings (just 16) and almost double the level of beer consumption.Early deaths caused by heavy alcohol consumption, regardless of the type, may be taking years off of France and Brazil’s life expectancies. Countries with the lowest levels of beer and wine consumption had the least amount of years lost, except for a few countries including Italy. Italians consumed a relatively smaller number of beer servings on average but consumed a large amount of wine. In fact, Italy is only second to France in servings of wine consumed by the average person, per year. While wine does have some health benefits, the Italian culture and diet may be leading factors in Italians’ longer life expectancies. An overall look at years of life lost to alcohol, regardless of GDP, produced a very long list of countries that lose life to alcohol. Belarus not only consumed the greatest average number of liters of pure alcohol per capita, but it was also among the countries with the most years of life lost due to this annual alcohol consumption (14.4 liters). Brazil’s average consumption was exactly half of Belarus’, while Belize, Kazakhstan, Thailand, Moldova, Peru, Mexico, and Mongolia all consumed less than half of Belarus’ 14.4 average liters yearly. This wide range of consumption may suggest that the amount of pure alcohol consumed may not be the only factor of average life expectancy. The way in which countries drink may likely be another factor, which we’ll look at next. Russia was the only country to be labeled the riskiest, in terms of patterns of drinking. Russians also consumed more spirits than any of the other top GDP countries: an average of 326 servings per person in a single year. 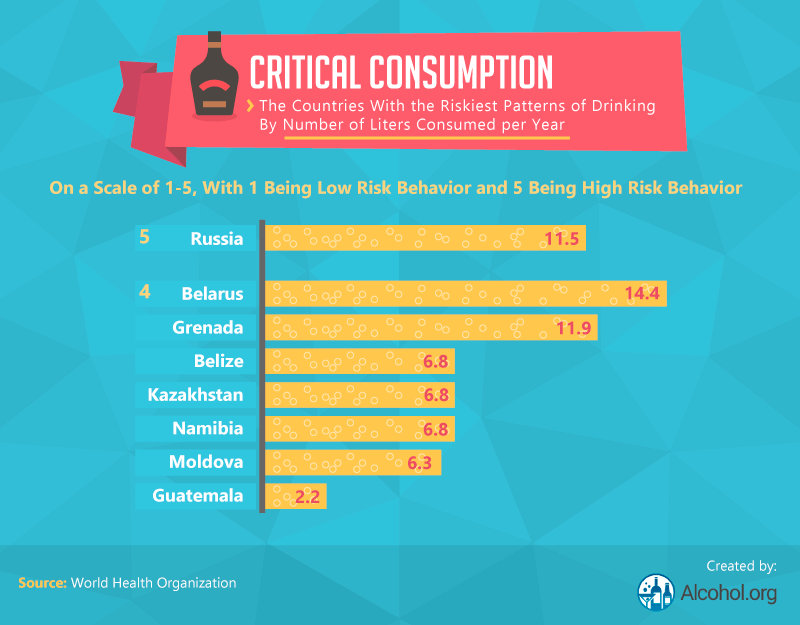 Belarus, a country that drinks the most liters of pure alcohol than any other country in the world, was also classified as having one the riskiest pattern of drinking. These countries, along with Kazakhstan and Moldova, were also classified as countries with the most years of life lost to alcohol, showing that there may be a strong link between risky behavior patterns like days-long binge drinking which have been linked to early death in men. However, Namibia and Guatemala consumed less alcohol than the U.S. and had some of the riskiest drinking patterns, but didn’t have the most years of life lost. The correlation between life expectancy and alcohol consumption doesn’t seem to be a positive one. Drinking wine in moderation may be beneficial for some people’s heart health, but stopping at just one glass isn’t always as easy as it seems. Staying sober is a difficult feat and living in a country where alcohol is a major part of the culture can make sobriety even more challenging. Identifying the problem is the first step, but finding the right treatment facility and treatment approach to fit your needs can be just as challenging. We’re here to help. For more information on prevention, treatment, and recovery, visit us online at alcohol.org. We scraped the WHO’s Substance Abuse Country Profiles to find each nation’s per capita consumption of beer, wine, and spirits per year. We analyzed their assessments, such as years of life lost to alcohol (YLL) and patterns of risky drinking (PD), to examine each country’s consumption correlation to overall health. We compared consumption rates per capita with each country’s average life expectancy but narrowed our life expectancy and alcohol consumption analysis to the top 12 countries by gross domestic product. We also included results for the U.S. for comparison purposes.